As you can see from the video above, the Min-Etune is essentially an auto-tune system, similar to the one previously found on Gibson's high-end Les Pauls and robot guitars, such as the Dusk Tiger. You pick the tuning, strum the strings and the tuning pegs turn automatically. Like the systems found in the aforementioned models, it's built by German firm Tronical Components. 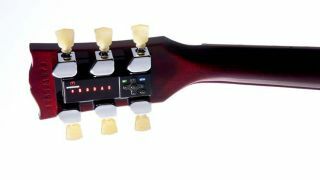 How's it different to previous Gibson auto-tuners? The key difference is that the Min-Etune is hidden in a black box on the back of the headstock and can be installed as an optional extra on a range of more affordable Gibson models, primarily the forthcoming '50s, '60s and '70s Tribute Les Pauls and SGs. In addition, instead of being operated via the guitar control knobs (requiring more body work/wiring), the Min-Etune has it's own controls built into the headstock unit. We've yet to get hands-on with one, but Gibson has already posted the (27 page!) Min-Etune manual online. Essentially the unit can store three 'banks' of six tunings - six because the presets in the bank you select are indicated by the same LED-lit letters that are used to display the strings. The bank that you are using is navigated to via a small D-pad and is indicated by the colour of the LEDs. The red bank is the go-to for most standard tunings, including 'Standard', 'DADGAD', 'Drop-D', 'Low D', 'Double Drop D' and 'Eb'; the green bank is all about open tunings and includes options for open E, A, D and G, as well as 'Dobro' and 'All 4th'; finally, the blue bank has six slot free for user-defined presets. So that's a total of 18 tunings available, via what we hope will be an easy interface. Will it be worth the money? It's too early to say without trying it out for ourselves. 18 tunings at the touch of a button is an exciting prospect, but the fact that it adds a not inconsiderable $400 (approx. £249) to the guitar's MSRP, requires a (supplied) rechargeable battery pack and, judging from early videos, makes a slightly annoying whirring sound when tuning, could deter some. Really though, Min-Etune will live or die by the ease-of-use of its interface.